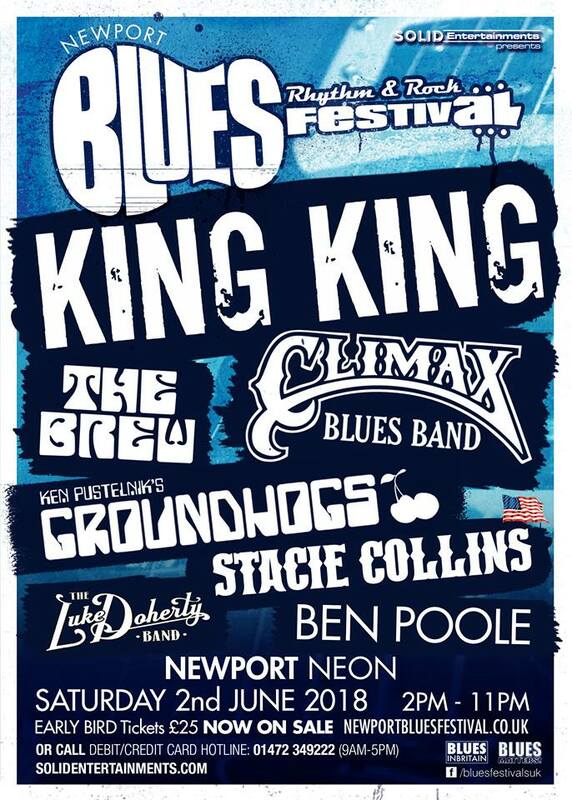 Arriving in Newport on the 2nd June are the holders of not one, not two but THREE FORM UKBlues Awards King King. The line-up promises to deliver music that will rock your blues socks off! With The Brew playing once again in the UK as they Shake The Tree of exciting rock that will power through The Neon. Climax Blues Band, we will have to wait and see if they perform their 1976 hit “Couldn’t Get it Right”. They blend jazz and blues still playing live with 18 albums, the will hit the right spot. Ken Pustelnik’s Groundhogs, Joining Ken’s drumming to rock out Newport are Latch Manghat, Bass; Sol Latif, Guitar and vocalist, Chris D’avoine. Keeping the flow of music rock blues guitarist extraordinaire with his band Ben Poole. From U.S.A. Stacie Collins, her fifth album Roll the Dice, the perfect showcase for her exuberant, harmonica-drenched, cocktail of rock, blues, and Americana. Then there is Newport’s own Luke Doherty Band. This award-winning band as Luke picked up on behalf of the band the winner Regional: Blues Act of the Year – WALES at the inaugural FORM UKBlues Awards held in Worthing. The Festival at The Neon the 2nd June will put the City on the map as live music rules and excites.